Oral cancer has one of the highest death rates of all cancers, and the biggest reason is the lack of awareness surrounding the disease. You will be surprised to know that in United States, one person dies every hour due to oral cancer. For individuals looking for Oral Cancer Screening New Hyde Park dentists at North Island Dental can help you. In addition, there has been a consistent increase in new cases among men and women under 50 years old who have never smoked. As per the research, it is clear that early oral cancer detection saves lives. In more than 90% of cases, the oral cancer was cured when detected at an early stage. At North Island Dental Arts, we offer oral screenings to patients as part of their routine oral exam because we feel it is that important. While not every extraordinary thing in your mouth is necessarily cancer, it is important to stay cautious as early detection is the key. If you are experiencing any of the following symptoms, please get in touch with our dental experts to arrange for an oral screening. There are very high chances of curing oral cancer if detected early. We provide Vizlite Plus, an FDA approved oral cancer screening light that helps dentists to detect oral cancer at the early stage, preventing it from getting worse. The Vizlite examination takes only minutes and doesn’t cause discomfort or intrusion. Vizlite Plus uses a special type of chemiluminescent technology for detecting any type of soft tissue abnormalities in the oral cavity. How is Vizlite examination performed? Vizlite examination is simple and quick. Dr. Amit Dhar performs an extensive visual examination of the cheeks, teeth and surrounding areas. The patient must swish with a pre-rinse solution around the mouth for approx one minute. Next, the Vizlite light is positioned towards the mouth. The patients are made to wear protective eyewear which shields the retina. The Vizlite light exposes any lesions or abnormal tissues that would be invisible to the naked eye. This unique dental equipment can be a life saver, so it is important to schedule regular dental checkups. If you have any questions regarding oral dental screenings or Vizlite Plus examination, call us at: 516-616-4800. Q: I am concerned and I am looking for oral cancer screening New Hyde Park seems to be one of the places that there are many places to get screened. Why is North Island Dental my best option? We are conveniently located right on Hillside avenue, and have been providing thorough screenings for oral cancer for our patients for many years. We believe that screenings for oral cancer are the best way of catching cancer at an early stage, thus being one of your best defenses against the terrible disease. If you are concerned about oral cancer, or just want to get screened to make sure your oral health is in good shape, contact our office today. Q: How do I know if I need an oral cancer screening? Oral cancer is a horrible disease, and one of the most effective ways of protecting yourself against it is to ensure you are screened regularly. Cancer that is caught early is typically easier to treat, so it is important that a thorough assessment is conducted on your mouths health regularly. We advise our patients to come in regularly for oral checks as well as inform you the best ways to keep an eye on your oral health when you are not in the office. Contact us to learn more today about oral cancer screenings and prevention. Q: Where can oral cancer occur? Most oral cancer occurs in the floor of the mouth or the tongue, but there are other areas that can be affected as well. Cancer can show up in the upper or lower lips and jaw, the cheeks, and the gums. Oropharygeal cancer is a type of cancer that occurs in the back of the tongue as well as the throat tissue and tonsils. This specific type of cancer accounts for about a third of all oral cancers. 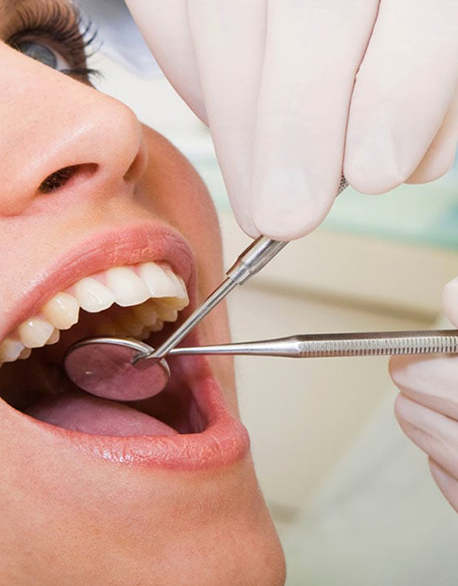 At North Island Dental Arts, our oral cancer screening will check you for all different types of oral cancer. Q: How at risk am I for oral cancer? Due to certain lifestyle choices, medical history, and other factors, the risk for oral cancer can be greater or worse from person to person. For example, people who use tobacco products are about six times more likely to develop oral cancer at some point in their lives. People who heavily drink are also at a greater risk for cancer. To learn more, contact us to schedule your appointment today at our New Hyde Park office. Q: How can I prevent oral cancer? Getting screened is important. The American Cancer Society even has recommended comprehensive oral screenings and soft tissue exams at least once a year, but many people do not heed this advice. The screening is a painless procedure and can be a lifesaver. Contact us to schedule your appointment, or ask us any questions you may have about oral cancer screening.